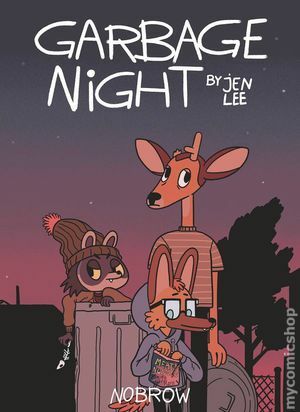 (W/A/CA) Jen Lee In a barren and ransacked backyard, a dog named Simon lives with his two best friends: a raccoon and a deer. The unlikely gang spend their days looting the desolate supermarket and waiting for the return of the hallowed 'garbage night.' But rumor has it, there's a nearby town where humans still live. Can free food be far behind? It's time for the dystopian adventure of a teenage lifetime! (For animals who wear hoodies, that is!) Cover price $18.95.